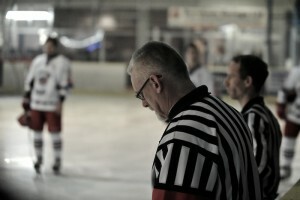 Slough Jets took on Bracknell Bees with Mindy Kieras missing the game and the home team forced to ice just 3 imports. Two quick goals came nearing the middle of the first period that put the home team on the back foot. Matt Foord opened the scoring at 9.23 and Grant Rounding doubled up at 9.45 for a 0-2 first period. The teams battled to a 9-9 shot second period clean sheet meaning the final period started at 0-2. Rounding doubled his own tally at 46.32 for 0-3 and with 4.54 left to play 16 year old Ivan Antonov netted the fourth for the visitors and concluded the win. Slough Jets travelled to Sheffield for the opening game of the weekend to face the Steeldogs for the penultimate time this season, just 8 days ahead of the final meeting at Ice Sheffield. 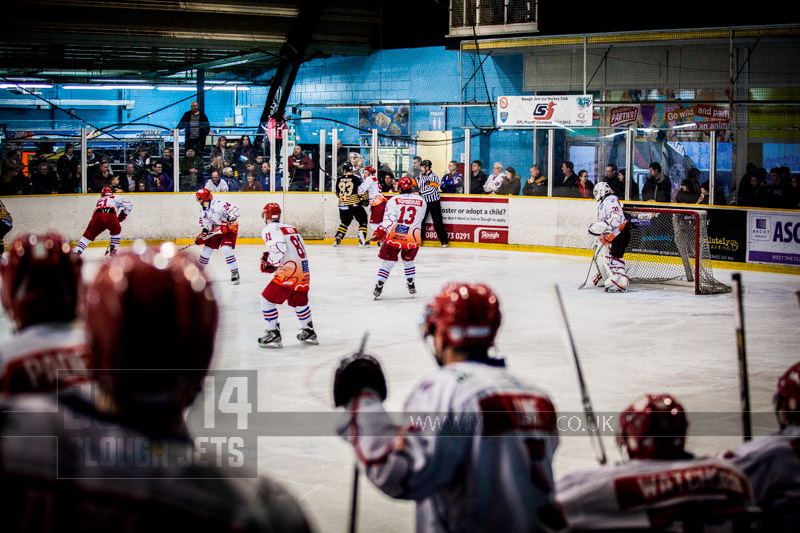 Frantisek Bakrlik netted just 18 seconds into the game and that set the tone for the opening period as the visitors sent home a steady procession of 5 goals. Darius Pliskauskas scored at 2.57 and then again at 13.28 converting a 5 on 3 chance to make it 0-3. Mindy Kieras scored on the remaining 5 on 4 powerplay at 14.27 and Bakrlik scored his second at 15.53 to make it 0-5. The middle period saw the visitors ease off but with 1.18 left Slava Koulikov made it 0-6 with his first goal of the night. Koulikov scored his second at 41.29 and at the other end of the final period Ciaran Long scored Slough’s 8th at 56.28 while Gregg Rockman played out the remaining 3.32 to claim his third shut out of the season. Slough Jets hosted Milton Keynes Lighting for the first of two visits to the Hangar this month and the teams entertained the fans with a quality game of hockey. The middle period flew by as the teams played high intensity hockey but the first twenty minutes failed to see either netminder beaten. The middle period saw the goalscorers for both teams showcase their talents. Slough started the scoring at 20.29 through Adam Calder but Gary Clarke levelled at 1-1 at 24.40. Just 14 seconds later Darius Pliskauskas made it 2-1 before Calder added his second of the night at 26.00. Aaron Connolly scored at 27.19 to make it 4-1 and Nick Poole called Milton Keynes’ time-out. The visitors set about a come back started by Adam Carr just two minutes after the time-out. Leigh Jamieson netted a powerplay goal at 35.33 and Michael Wales made it 4-4 with at 35.59 goal. Both teams searched for the go ahead goal at the start of the third period and when Doug Sheppard provided it for the home team at 49.31 there was no looking back. Sheppard doubled the lead at 52.12 and Slava Koulikov was on hand at fire the puck into the empty net at 59.55 to complete the scoring.